The type of phytase to choose depends on the degree of cost saving you want to make from improving nutrient uptake — in other words, how aggressive you want to be about applying full nutrient matrix values with confidence. It also depends on your view of phytate as an anti-nutrient. Phytases have their own individual pH optima at which they function at their best. In order to improve phosphorous (P) uptake and reduce the anti-nutrient effects of phytate, a phytase needs to be highly active at the low pH conditions which prevail in the upper digestive tract. The below figure highlights the difference in activity between competitor phytases and Axtra PHY(Buttiauxella phytase) at low pH values. The superior performance of Axtra PHY(Buttiauxella phytase) at low pH compared to other phytases is clearly demonstrated. Phytate exists in many forms eg. IP6, IP5, IP4 etc. Of most concern in animal nutrition is IP6 which consists of an inositol ring with six orthophosphate groups. Numerous studies have shown that the anti-nutritive effect from phytate is considerably reduced as soon as phytase cleaves one orthophosphate group from IP6 to form IP5. The lower molecular weight esters, such as IP5 and IP4 do not possess the same binding power for protein and trace minerals as the IP6 molecule. Consequently, a phytase such as Axtra PHY that rapidly cleaves an orthophosphate group from the IP6 molecule and then preferentially moves onto another IP6 molecule will be very powerful in terms of reducing the anti-nutrient effects of phytate as well as making more P available to the animal. The speed at which a phytase cleaves a orthophosphate group from the inositol ring (IP6) in the upper digestive tract will also determine the bio-efficacy of the phytase in the animal. The faster the phytase gets to work, the more the antinutrient effect of the phytate molecule in the stomach and upper gut can be reduced; and more nutrients are released for the animal to absorb from the digestive tract. Research has shown significant differences between phytases in their bio-efficacy, both in terms of their time taken to break down IP6 as wekk as improving diet digestibility and reducing the anti-nutrient effects of phytate in animal diets. 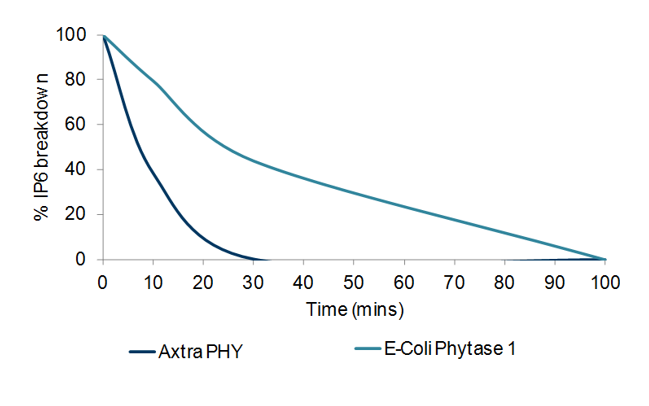 The chart below clearly illustrates the time benefits of using Axtra PHY (Axtra Phy) compared to an E. coli phytase and is one recent example of improved technology in this sector. 4. High thermostability, up to 95°C (203°F). Significant loss of phytase activity during steam conditioning and pelleting of feed is a limiting factor in phytase use. There are two ways of making enzymes more heat-stable. One approach is to use a coating to protect the enzyme; the other is to manipulate enzymes into more thermostable variants. Both technologies significantly improve enzyme stability and have been successfully used to produce commercial products. A good coating such as the one applied to Axtra PHY needs to protect the enzyme molecule through the feed manufacturing process, but also needs to release the product very quickly in the upper part of the gut to ensure optimum bio-efficacy is achieved. 5. In vivo scientific proof. The amount of data behind a phytase will determine how confident you can be in applying the matrix values in a feed formulation. Animal trials to validate the bio-efficacy of a phytase and gauge responses to different phytase levels are costly, however, they are a necessity to establish reliable matrix values. Pigs and poultry respond differently to phytase and the age of an animal can also influence how responsive they are. These are further factors that need quantifying during in vivo trials. The matrix values for Axtra PHY have been derived from extensive animal trials in both pigs and poultry. The short answer is yes with Axtra PHY.